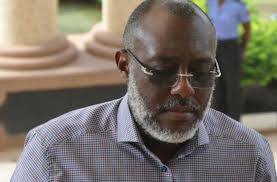 I can no longer feed my family, Metuh tells court – Royal Times of Nigeria. FORMER People’s Democratic Party (PDP) spokesman Olisa Metuh told a Federal High Court in Abuja yesterday that he could no longer feed his family because his bank accounts have been frozen by the Economic and Financial Crimes Commission (EFCC). Metuh said he learnt early yesterday that no debit order was placed on his accounts on Monday night, when he tried unsuccessfully to make a transaction in one of the accounts. The ex-PDP spokesman spoke while testifying at the resumed hearing in his trail. Metuh is being tried, with his company, Destra Investment, on charges of money laundering. Metuh, who is testifying as his own witness, said the freezing of his accounts has made it difficult for him to either feed his family or buy items as common as water and pain-relieving medicine like Panadol. He said: “The EFCC seized my accounts yesterday night and I can’t get money to feed my family. I am in total shock as I am here talking to you. Metuh associated the freezing of his accounts with his ongoing trial, in which he is accused of unlawfully receiving N400 million from the Office of the National Security Adviser (ONSA) in 2014. He queried why the EFCC would freeze his accounts, having allegedly seized his assets earlier. Metuh said what the EFCC earlier seized included assets with the Asset and Resource Management Company Limited and his funds in other banks. He said the action of the EFCC has denied him access to his funds worth more than the amount at stake in the trial. Metuh noted: “They have alleged in this case that N400 million was stolen. Why would they not limit it to that amount? In his earlier testimony yesterday, Metuh claimed his trial was because he was critical of the ruling All Progressives Congress (APC) while he was in office. He tendered the print-outs of some media reports of the news conferences he addressed as PDP spokesperson in July 2015. Metuh said the news conferences, which were critical of the APC and the President Muhammadu Buhari administration, earned him threats and eventually his arrest and subsequent prosecution. Reacting, Metuh’s lawyer Onyechi Ikpeazu (SAN) said he did not object to what his client said, but except the part where he spoke about ending the case. The trial judge, Justice Okon Abang, noted that the issue Metuh raised about his accounts was not part of the case before the court. The judge asked Metuh to ask his lawyer to discuss the issue with the lead prosecuting lawyer, Sylvanus Tahir, who was equally in court.